"You make the bed, you do the dishes, and six months later you have to start all over again." In just a few days, people all over the nation will unite to challenge the epidemic of overwork and overscheduling that turns days into treadmills and families into strangers. Take Back Your Time Day, on Friday, is designed to question how we spend our time and how we can reduce time spent on activities we don't enjoy. In my book "Let Go of Clutter," I provide a household and personal maintenance checklist which lists over 60 of the most common types of maintenance, from bill paying to vacuuming, divided into 12 categories. 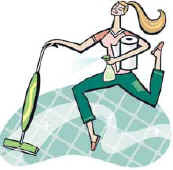 One chore almost everyone would gladly drop is housework. Think of the free time you would have if you didn't have to do dishes, clean toilets, dust bookshelves or vacuum carpets. Think, too, of the pigpen your home would become without regular upkeep. Luckily there is an alternative, and for me it came with the answer to the age-old question, "What is Life?" Life, I realized years ago, is 5 percent joy, 5 percent grief, and 90 percent maintenance. Think about it: 90 percent of what we spend our time doing is stuff we need to do over and over and over again. And when maintenance is lacking in even a small number of life areas, chaos and clutter can creep up on you. Unfortunately, then it becomes part of the "5 percent grief" segment. The good news is that even though you can't really change the 90 percent part of the equation, you can increase what I call your "joy quotient" by learning how to make most types of maintenance more enjoyable – or at least easier and certainly less time-consuming. Locating the tools and supplies to get the job done. Using products that don't work well or are unpleasant to handle. Putting away all those tools and supplies. When any type of maintenance feels like too much of a chore, it's easy to rationalize procrastination. But the longer you put off maintenance, the bigger the job gets. Which is one reason many people feel so frantic as the holidays approach. If making your home "presentable" for guests looms large on your yearly holiday to-do list, don't despair. It's not too late to learn how to get your house holiday-ready, year-round. There are several commonplace, inexpensive, yet exceptionally easy-to-use products that I know from experience can help "easify" various maintenance tasks. Although some may be familiar, people often are too busy to figure out the best ways to use them – not to mention where to put them. Make it easy to throw things away. If you don't have at least one trash receptacle and/or recycling bin in each room, it's possible that you're not making it easy enough to discard your detritus. Look around your home and notice where things tend to pile up. Those could be places that are begging for a bin. Just remember to treat your wastebaskets like babies: Keep them within close reach at all times, feed them frequently and change them often. And do yourself a favor: Get sturdy, useful-size wastebaskets, not those rinky-dink ones that look like large vases and appear too delicate to use. Also, avoid the ones made of mesh, wicker, or any material that lets little bits and pieces slip through. Make it easy to minimize paper clutter. Certain office products can make life much easier when used in unlikely places such as the kitchen. For example, setting up a "mini-file" (a small plastic file holder that holds about a dozen folders) on a kitchen counter makes it easier to deal with papers that tend to pile up there, such as coupons, recipes, shopping lists, takeout menus, receipts, appliance instructions and school-related papers. Likewise, stocking a small basket with frequently used office supplies (such as scissors, pen, pencil, highlighter, note pad and Post-its) and putting it near a mini-file makes it easier to clip out coupons, mark catalogs and make quick reminder notes. This can help limit piles of newspapers, magazines and catalogs that get saved because they contain items to be harvested "later." Make it easy to keep sinks and counter areas clean. Bathrooms and kitchens are easy to make messes in, so why not make it easy to clean them up? Keep a roll of paper towels on a handy dispenser near each sink. This will make it easier for anyone in the household to wipe toothpaste spatters off the medicine cabinet mirror or mop up mishaps on kitchen counters. A container of pre-moistened cleaning wipes, such as Glass Plus Wipes, is also helpful to have on hand in both kitchen and bathroom. By taking a few seconds to clean up any areas right after they've been splashed or splattered, or at least at the end of each day, the need to ever do a major clean-up job is almost eliminated. Make it easy to keep shower, bathtub and toilet clean. There are several brands of "daily shower spray" available, and they all work well. Once you've given your shower a good cleaning, you'll rarely have to do it again if you simply spray the shower and/or tub liberally after each use (or daily). Keep the product either in the shower or within arm's reach, so it's easy to remember and use. A similar product is available for keeping toilets clean; it also only needs to be used once a day. Again, since this is something you need to remember to use daily, it makes sense to keep it within easy reach near each toilet. Make it easy to keep floors clean. A cordless, rechargeable upright vacuum cleaner combined with a Swiffer duster is an easy way to keep all types of floor surfaces free of dust and debris. The vacuum is useful for carpets, rugs, hardwood, vinyl and tile, the Swiffer for dusting hard surfaces. Depending on the floors in your home, you can either get an all-in-one unit (the Dirt Devil SweeperVac + Swiffer, about $30) or buy the vacuum and Swiffer separately (Eureka's Cordless Boss Upright, about $50; Swiffer, about $10). Choose a centrally located, easily accessible place to install the charging unit and to store the Swiffer supplies, so you can grab them instantly for quick cleanups anytime. To wet-clean hard surface flooring, products like the Swiffer Wet-Jet (about $20) are so easy to use they're actually fun. You can talk on the phone (a cordless headset-style will prevent neck strain) while effortlessly cleaning your floors, and be done with this chore in a few short minutes. Harriet Schechter has helped thousands of people conquer chaos since 1986, when she founded The Miracle Worker Organizing Service in San Diego. She now resides in Santa Barbara. The author of three books, including "Let Go of Clutter" (McGraw-Hill, 2001), she is also a columnist for sdhome magazine. Her online advice column can be found at www.MiracleOrganizing.com.